Are you experiencing perimenopausal symptoms such as hot flushes, mood swings, chest tightness, irregular periods, dry eyes and skin? Do you know that regular Pilates and TCM can help you alleviate these symptoms and improve the quality of your life as you journey through the Perimenopause stage? You are not alone. We are with you! Learn how to manage your Perimenopause journey naturally with exercise and TCM methods. 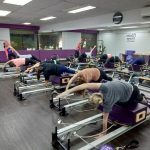 Experience hands-on sessions with Pilates Reformer exercises & Acupuncture. Sign up now! Limited to the first 40 participants. Limited to the first 40 participants.